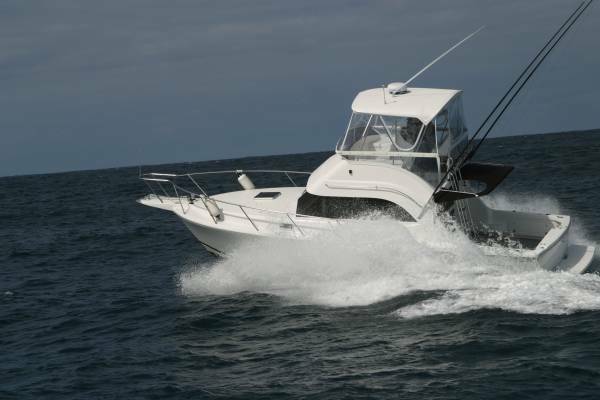 Caribbean 32 NEW BOAT, Mansfield Marine, WA's CARIBBEAN DEALER present the Caribbean C32. Based on all the good things that the Caribbean 35 has offered for decades. IF YOU WANT THE BEST BOATS AND THE BEST QUALIIFIED SERVICE THEN PLEASE CALL US ABOUT CARIBBEAN CRUISERS AND HOW WE CAN HELP YOU. The Caribbean 32 Flybridge Cruiser has been designed and built with the whole family in mind. Boasting two cabins, large bathroom with separate shower stall, modern galley and a saloon to fit the family and friends. The C32 is the perfect all-rounder. As with all Caribbean's there is ample room in the cockpit for socialing with friends or fishing the trench! In the cockpit there is plenty of under floor storage, a built in icebox (optional fridge plate), transom door and mouded bait tank / storage boxes. The fybridge is very spacious, a well designed dash command station with plenty of room fo extra electronics, hard-top with overhead console, helm / companon chairs, and two lounges ensure that you will have room for all the crew when cruising to your favourite destination. The styling of this boat is modern to say the least. It will impress all who step aboard. Put all this together with a hull design and engineering that has proven itself time and time again. 50 Years of boat building experience is evident in the function, ability and clever layout of this boat. The 2 x YANMAR 4 cyl 240 engines with shaft driven four blade propellers are perfect for this boat's economy and spirited performance. If you want any options fitted to make your C32 unique, then we can do it all. 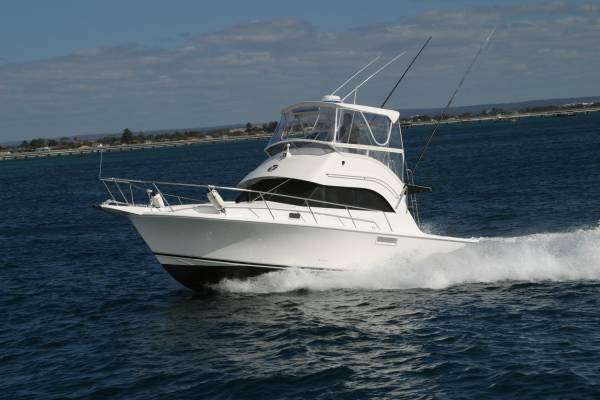 Mansfield Marine can enhance your new boat with any option imagineable. Come down and see some Carbbean's that we have enhanced recently. Whether you are a new or seasoned boatie, we offer pen set-up, maitenance and servicing as required. Leave the stress to us, you just GO BOATING!. WA delivery charges apply to above quoted cost. Call Travis Mansfield on 0419911560 or Coby Mansfield on 0418958658 for more info on any Caribbean model. NOTE: Prices noted here are subject to change without notice. Price to be confirmed at time of order. 2 x Cummins 220B, with shaft drive. Engine room: Very well designed with plenty of room to access all euipment as required. A well designed spacious galley, with corian style tops, sink, counter-top bin, microwave, 55ltr fridge and a cooktop. All with great vision of the scenery outside for the chef. 55ltr Fridge/fzr inside, ice chest in cockpit ( optional fridge plate) and small fridge optional in Flybridge. Fwd cabin with double sized bed, second cabin with 2 x bunks, and room for 2 on saloon lounge convertibles. Interna shower module and transom shower ( H+C). 12 volt with waste holding tank and macerator pumpout. 10 Lifejackets, 1 x406 Epirb, Offshore flare kit and 3 x fire extinguishers. Reversing 12v anchor winch with foot switch, anchor and chain. NOTE: Please note that the photos within this display may show some features and options that are not standard in the price as quoted. We can quote on options separately as required. Perth delivery is not included in the above quoted price. 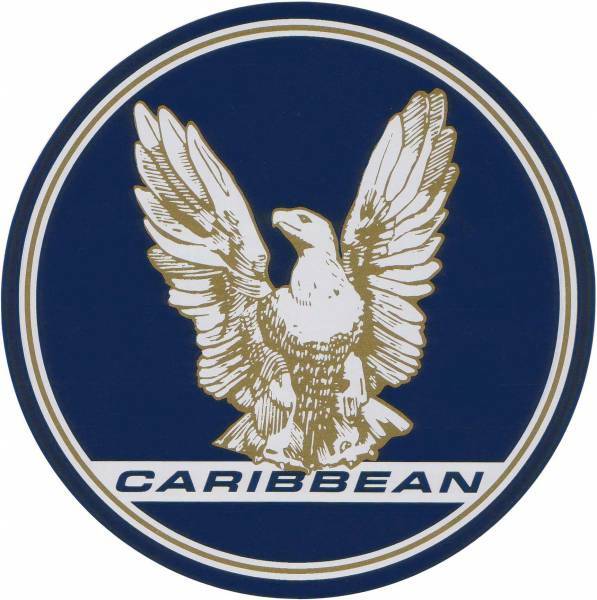 We believe that the Caribbean brand is a great investment, both financially and in lifestyle. Mansfield Marine are the one stop shop for any Caribbean buyer. You just ENJOY THE BOAT, we look after everything!